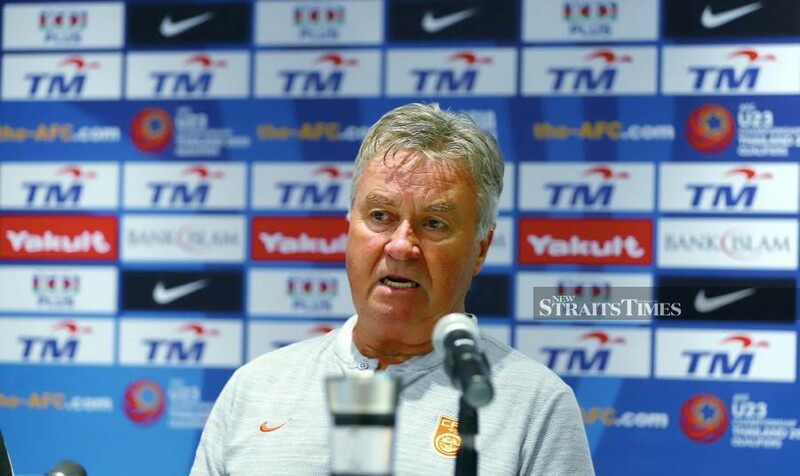 BUKIT JALIL: Renowned Dutch coach Guus Hiddink has the task of building up China’s football, and Malaysia are standing in their way. The two nations are drawn in the same group with the Philippines and Laos in the AFC Under-23 (U-23) qualifiers at Bukit Jalil. China are looking to bounce back from the setback of exiting the group stage of last year’s AFC U-23 Championship which they hosted. Hiddink, 72, tasked with leading the China U-23 side to the finals, has a similar problem as Malaysia’s Under-23 coach Ong Kim Swee — a lack of competitive match time for his players. The Dutchman said earlier today (Thursday) that many of the players in his Under-23 squad don’t get to play enough games in the Chinese Super League. Former Netherlands manager Hiddink is lauded for taking South Korea to the semi-finals of the 2002 World Cup, where they beat mighty Italy and Spain on their way to the last four. Seventeen years on from that historic feat, Hiddink said he is pleased to see improvements in Asian countries on the world stage. He has called for more countries to invest in youth football. “It’s not always fair to make a comparison with leading countries in world football like the Europeans and South Americans. But what I experience now is that football in Asia has developed a lot,” he said. “Having good coaches is the most important thing to develop youth. (Football) Kim Swee says national youth team still a "work in progress"